Dodging classes and work, I've managed to collect and paint up an acceptable fleet, although several of the escorts still need painting. I've got a thousand point, sixteen-model list... but I was painting first and adding up the points later. This is Splinter Fleet Mordggian, as it currently stands. One official Hive Ship. 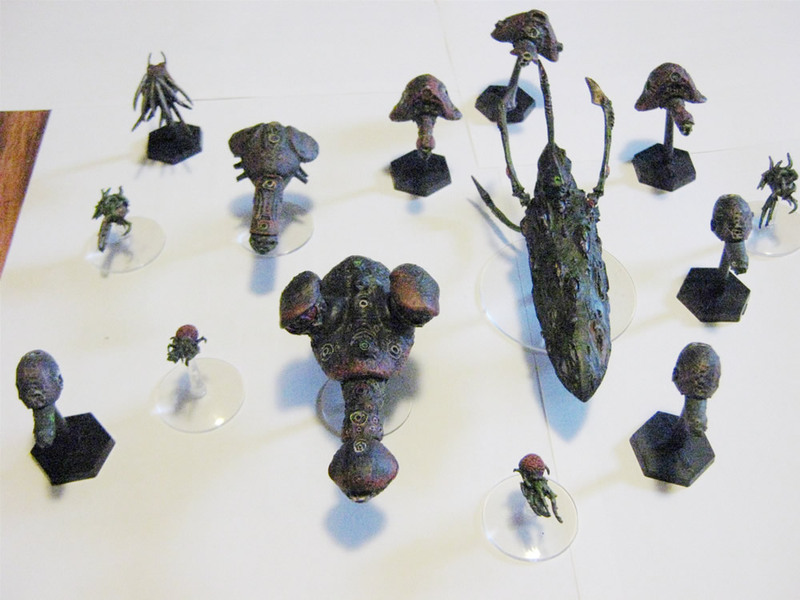 The snail-like ships are Phalons from Ground Zero Games' Full Thrust. I like the Phalon models a great deal, the battleships make excellent capital ships and the smaller scouts are good drones. 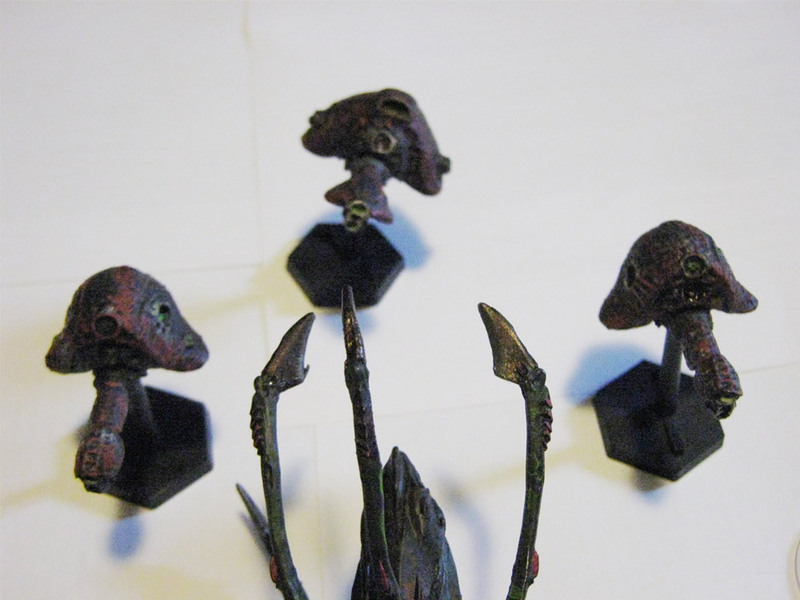 Top left is a Shadow Scout with the tentacles put on backwards. I thought it came out kind of cool. 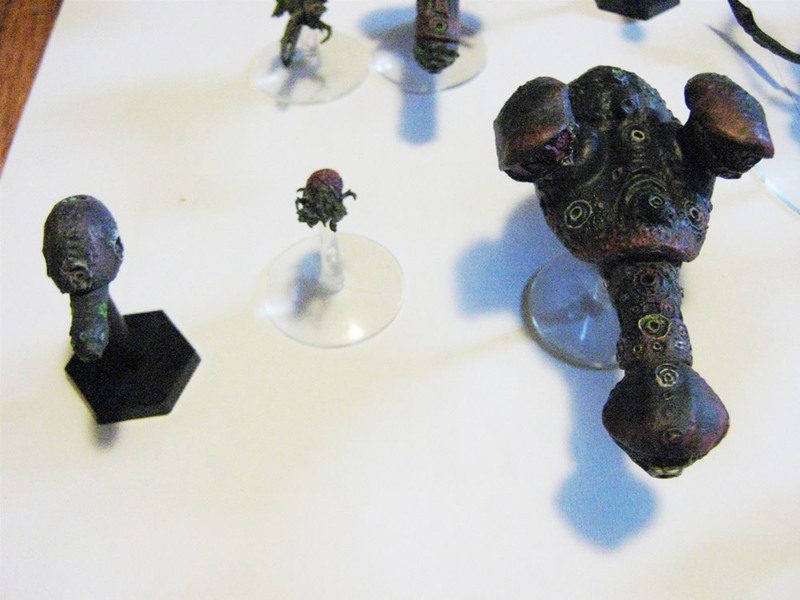 A Phalon Battleship on the right, and I'm fairly pleased with the way the pattern on the shell came out. To the left is another Rift Blight. These guys painted up very nicely, although I'm not a particularly good photographer. In the back is that Shadow Scout. Three Phalon cruisers (left and right are heavies, a battlecruiser in the center) that are going to substitute for torpedo Kraken. I think the camera focused on the hive ship's tentacles, instead of the other ships. This is the best picture I made. 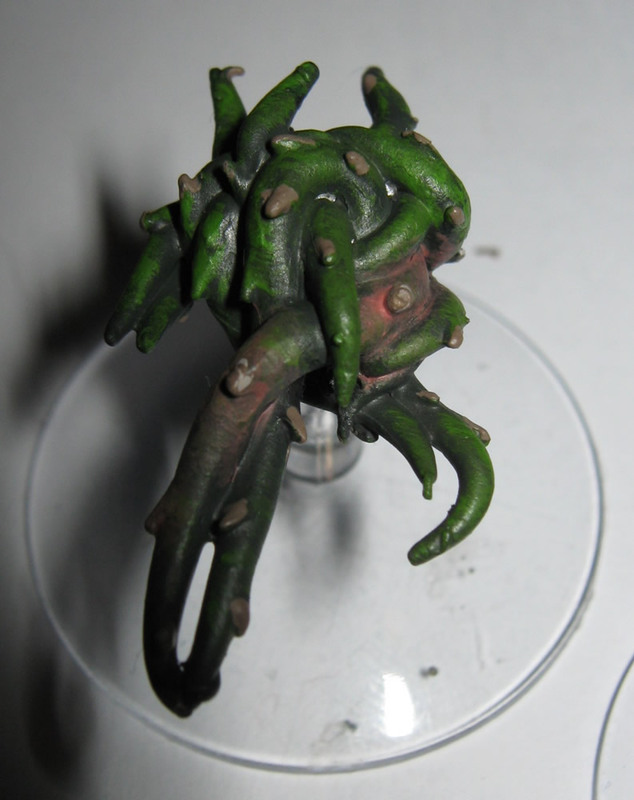 It's a Rift Blight from Reaper Minis, and it's such an awesome model. The tentacles have teeth on them, which you can actually see in this picture. The "Spaghetti with Meat" Rift Blight. It's a got a huge, exposed brain, but also the same sort of thorny tentacles. These guys are going to look great chowing down on Imperial ships. Next I have some larger ships to build. 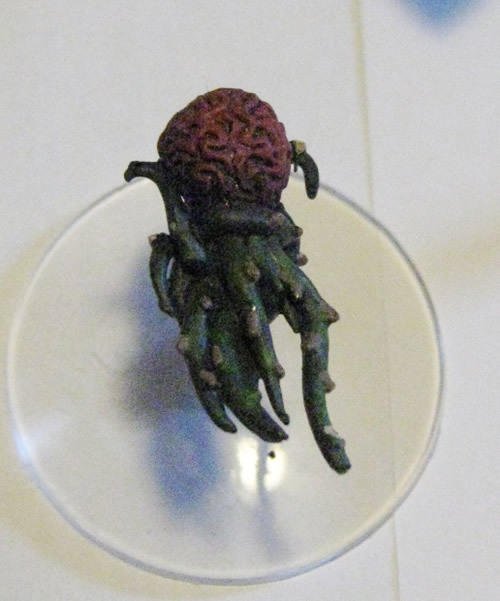 The Phalon Carrier is just about the size of the Tyranid Hive Ship, and my next figure is going to be a Goroloth Drone, which is about the same size. 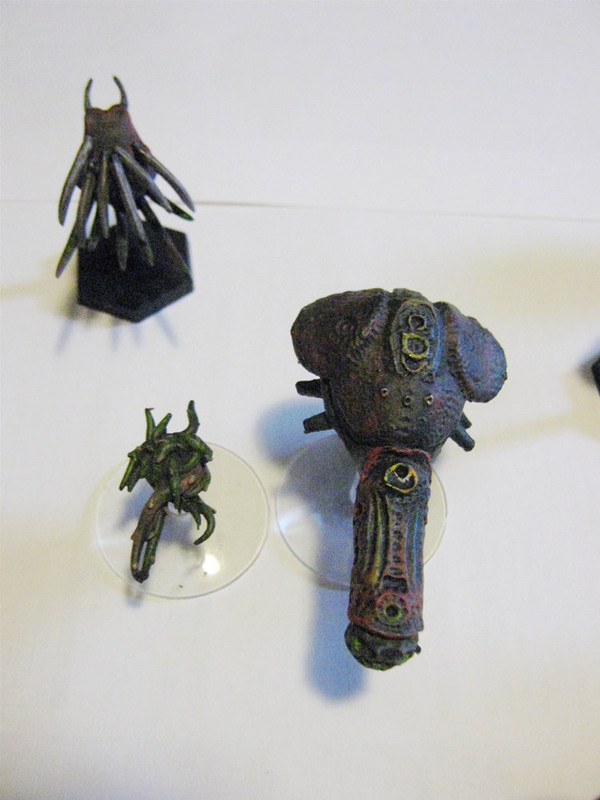 The larger Goroloth mini, as yet unacquired, is between an quarter and a third larger than that. My big guy, however, is going to be the monstrous Armorcast Kraken, which will dwarf both of these. Some notes on "N is for Neville"
Dead but Dreaming 2 is out, and it contains my story "N is for Neville." You should go buy it from Miskatonic River Press. The cover is slightly different from the one previously posted, but the contents are pretty darn good. For those of you who like your metatext fresh, here are my story notes on "N is for Neville." All my stories are special. They’re all pretty personal pieces, expressions of myself, my heart and sweat on the page. And hey, if someone pays me money to print it, that's extra gravy. “N is for Neville” is its own kind of special. I worked it for a while before it came out in its current form, including a month-long period in which I was stuck. I couldn’t get the tone right, the characters didn’t speak to me, and the words just hung on the page, lifeless. What got me through it was Wilum Pugmire. I was reading his Sesqua Valley and Other Haunts, followed by The Fungal Stain and Other Dreams and I realized what I was missing decadence. The characters needed to be arty, wealthy, and bored. And Wilum’s writing showed me how to get that across. Which is why he appears in the story, and why the story is dedicated to him. What I didn’t expect was for Wilum to write a story that Tuckerized me, and to sell it to the same anthology. And that’s something that warms my blackened walnut of a heart. One of the reasons I write is so that I can consider these smart, eloquent people who love words as my peers. Because I love the conversations writers have. To listen to people throwing out idea after idea and pass them around, building on each others concepts until you have this grand, hypothetical castle in the clouds; that’s magic. Ideas are magic. I met Wilum at the 2007 World Fantasy convention. Like most writers I’ve met, he is enormously pleasant to talk with; intelligent and a fascinating conversationalist. More than most, Wilum has brought a great deal to my life and my writing. This story is dedicated to him because I would not be where I am today without his generosity and fascinating stories. Thank you, Brother Wilum.